The bulk of the Yachting cap is made from strong, 100% cotton twill material, with a sweat-resistant hem and reinforcing sewn around the inside. The brims are plastic (not cardboard), and covered in soft fawn-coloured suedette on top with navy covered twill beneath (to reduce glare on the eyes). 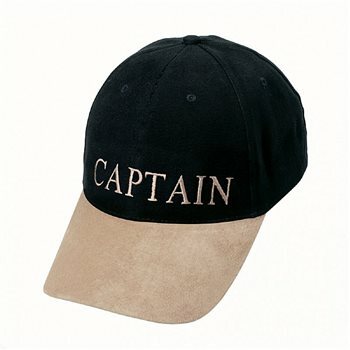 Each Yachting cap is heavily embroidered with a crew position in cotton thread. The quality is excellent as is the price.